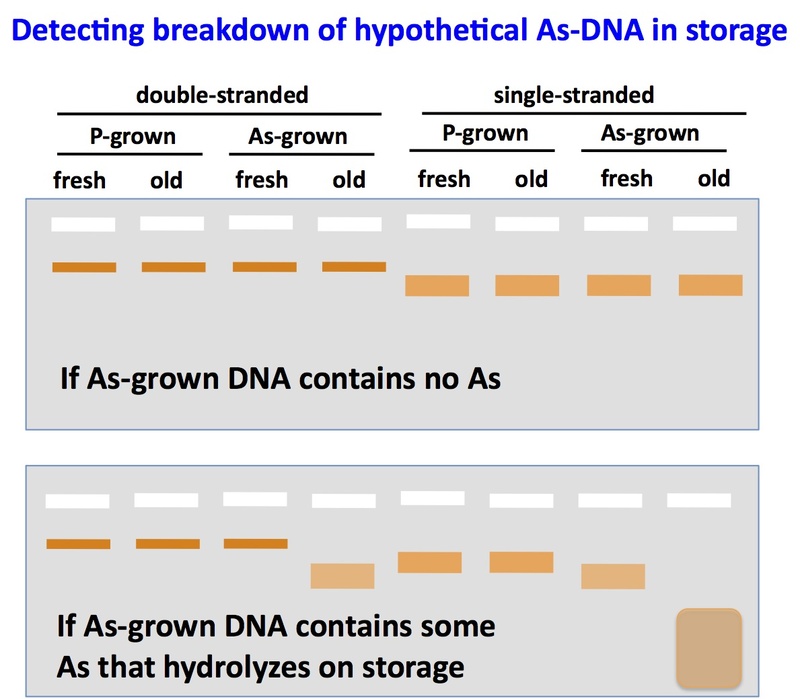 im curious about how much time the DNA you prepared has spent in solution since you prepped it — supposing there were C-Ar bonds in the DNA at the time of lysis, has so much time passed now that, given the hydrolysis rates that were experimentally determined and recently reported in this JACS communication (offensive link deleted), I'm worried that theres no hope of seeing positive signal even if there was one to begin with. Any thoughts about this issue? Perhaps keeping the DNA stored as a dry pellet and avoiding any encounters with water until the last minute would be the way to go. First, a few corrections: Arsenic is As, not Ar. The DNA backbone bonds are diester bonds, so the As is bound to oxygen (O), not carbon (C). It's of course not possible to purify DNA while avoiding any encounters with water. It's indeed theoretically possible that the GFAJ-1 DNA from arsenic-grown cells originally contained As in its backbone, and that the As bonds were destabilized once the DNA was purified away from the proteins and other cellular components. If the chemists are correct, the As bonds would all hydrolyze within less than a second. The AsO4 liberated from the DNA would then be seen just as background in the CsCl gradient, or lost entirely in subsequent purification steps. We would have to assume that the GFAJ-1 cells contain some powerful unknown-to-science DNA-binding proteins or other structures that stabilize the As bonds in the aqueous environment of the cell. These proteins would be removed during the initial DNA purification steps (SDS-lysis and phenol-extraction). Wolfe-Simon et al. did not report taking any precautions to prevent hydrolysis, so if their DNA prep really contained As bonds these must have been stable for at least the day it would have taken them to do the initial extractions, run the agarose gel, and cut out the DNA-containing gel slices. We don't need to count the time needed to send the gel slices to the LLNL lab at Livermore for Nano-SIMS analysis because the entire slices were analyzed (the DNA was not purified away from them). Loss of As from the backbone would change the structure of the DNA. It would now be As-free, but would contain a single-strand break at each site that previously had an As. If a substantial fraction of the backbone was As, the DNA would be extensively degraded. One way to check for hydrolysis of As bonds would be to run the DNAs in a gel, both intact and after separating the strands by boiling. 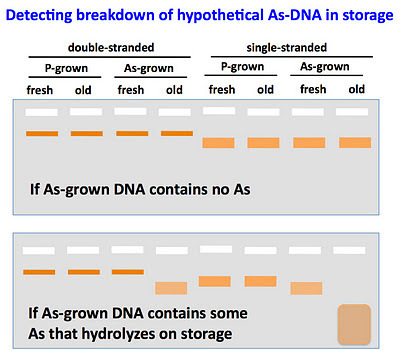 Normal DNA is stable for months, so we could compare the fragment lengths of the DNAs from As-grown and P-grown cells, both immediately after purification and after extended storage in aqueous solution. Here's a diagram of what we'd expect to see in an agarose gel. The upper orange band in the lefthand lanes is the long fragments of double-stranded DNA present in my DNA preps immediately after purification (see gel photo here), and the broader bands on the right are how single-stranded DNA would appear. Since the cell’s interior is aqueous, then it would seem reasonable that there has to be something preventing the spontaneous hydrolysis in vivo. As you point out, some form of stabilizing protein would seem the most likely candidate. If this protein is going to work, then it could (for the purposes of this argument) remain attached throughout the purification process. If so, then you might find As in the purified DNA, and should also find traces of protein. I don’t know if this would be enough to alter the 260:280 ratio, but DNAse digestion followed by SDS-PAGE might detect something. Definitely a hotdog experiment, but once the DNA is purified, not that difficult. SDS-phenol extractions are pretty harsh; for a protein to remain with the DNA it would need to have been covalently bound, which would certainly have complicated such cellular processes as DNA replication and transcription. And if the DNA contained a significant amount of As, the DNA would then contain enough protein that it wouldn't migrate properly in the gel but would stick as a blob of gunk in the well at the top of the gel. It also would band differently in a CsCl gradient.